These 100% Superfine Alpaca throws are practical yet very fashionable draped over your favourite couch or armchair. Wrap yourself in luxury on those cold winter evenings. Available in light blue or chocolate brown. Baby Blue Alpaca Throw is sold out! Enquire about other available colours and prices. Our alpaca rugs are made from our very own alpaca fibre and hand-woven by Legacy Lane Fibre Mill. Each rug is 3" x 5"
These pillows have a 70% alpaca/30%wool fill. 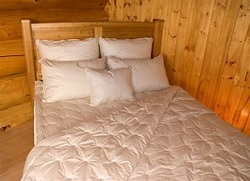 We offer alpaca filled duvets as a better alternative to feather duvets. Our duvets are available in crib, twin, double, queen and king sizes and fit easily into standard duvet covers. Light-weight, warm, breathable and considered non-allergenic, our duvets keep you warm in the winter, cool in the summer and look great on your bed year-round. These duvets are custom made by Salem Alpacas with our very own Canadian grown alpaca fibre. Shipping is not included in this order and the actual cost of shipping will be billed via paypal. Why use wool dryer balls? Depending on the make and model of your dryer, they decrease drying time, saving energy and money. They help to decrease both wrinkles and static. The dryer balls are re-usable so offer you an eco-friendly alternative to disposable dryer sheets. If you wish, you can scent them with your favourite essential oil. Hang these eco-friendly nesting balls in your trees and the birds will use the alpaca fibre to line their nests. Each bag has a set of 8 nesting balls. These make a great Christmas gift for anyone who loves nature. These soaps are felted with hypo-allergenic alpaca fibre. A handcrafted therapeutic soap bar will last much longer if it is felted and they are great for mild skin exfoliation.